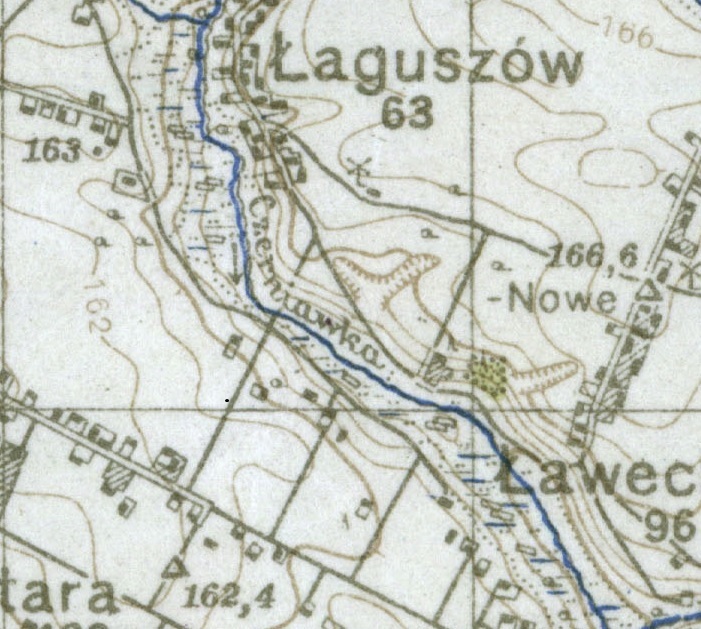 What are the units seen on the contours and spot heights of this WW2 topographic map? I'm not sure if the map is of Russian or German origin: I've seen the same style and map symbols on Russian army maps and German army maps (they are often the same apart from transliteration between latin and cyrillic alphabets). Although this particular map was certainly used by the German army - there are annotations in German on it of military relevance. The major contours (every 5th contour line) are labelled as 137, 154, 171. The spot heights show as e.g. 166,6 (comma being used as the decimal seperator in German, for instance) make me suspect that that it is 166.6 meters, but obviously the contour heights would be rather peverse in that case - each line is 3.4 meters. So presumably the original contours are based on some other unit system. Are the numbers here in meters? And what units have been used when the map was originally created? Those measurements are in meters. The area around Łaguszów is about 160 meters above sea level. I do not see the divisions of 3.4 meters to which you are referring on the map. However, in old Germany there was local land measure called the rod ("ruthe") which was highly irregular and varied from place to place and could be anywhere from 3 to 5 meters in length. The Prussian standard Ruthe was 3.466m, but as I said, in actuality for a given place the Ruthe could vary considerably.